Our Products >> .45-75 Winchester New,Lead, 1 Cartridge not a Box, LIMIT 5! 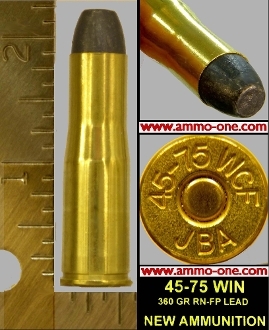 One Cartridge, not a Box: .45-75 Winchester a.k.a. .45-75 Centennial New Production by P.C.I., using New Brass Cases by J.B.A. with "45-75 JBA" HeadStamp and a 360 grain Lead projectile. Loaded to Black powder pressures, however, use only in rifles in excellent condition only, may not be for Original Antique rifles, shoot at your own risk. .45-75 Winchester New,Lead, 1 Cartridge not a Box, LIMIT 5!